It is to achieve success in the music classroom! Click on the book thumbnails to preview and print free excerpts to try out on your students. Every student can perform a steady beat and sing in tune! Did you know there is no such person as tone-deaf or a monotone? 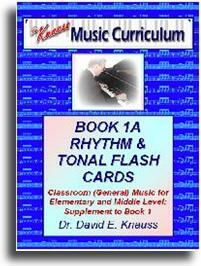 Ready made sequenced rhythm and tonal flash cards which include the best rhythm syllable system and Kodály tonal process! Fun music classes with no-fail skill focus that does more than just sing songs! Want to insure the increase of music aptitude and skills in students before age nine? The best active participation curriculum that flawlessly produces artistic musicians! Want to insure the greatest possible music skills achievement after age nine? Change from "music appreciation" lessons of fill-in-the-blank worksheets, to ultimate music producing procedures that engage every student in creativity! The Knauss K-12 Music Curriculum is a classroom instructional series for pre-kindergarten through grade 12. 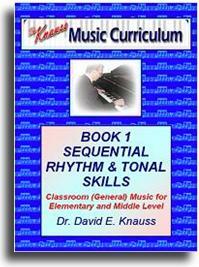 It is available as 5 user-friendly books that provide the music teacher with simple step-by-step instructions. This curriculum was designed by compiling the most successful classroom techniques, songs, and activities for the past 4 decades into 5 easy-to-use manuals. Primarily designed to teach music instructors how students learn music skills and perform artistically. Secondarily designed for what music activities best educate toward those skills and artistry. Is a core skills-based general music curriculum to teach students basic to advanced music skills and artistic performance. Units and activities specifically designed to meet all the MENC National Music Standards. 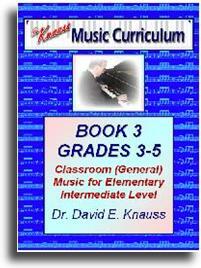 Offers grade-by-grade and lesson-by-lesson detailed music activities. Ensures the highest levels of music understanding and skill development. Includes the Orff, Kodály, and Dalcroze music education approaches. Utilizes students' all-time favorite songs. Is field-tested in award-winning music departments. "How to Teach..." i.e., many field-tested techniques that command results (proven, professional "skills of the trade"). Effective remedial activities for challenged students, and enrichment activities for exceptional students. Music skills and elements correlated to all styles of "classical" music and eras. Music report cards appropriate for each grade level. Tips for performing classroom music. Basic instrument set-up, and an enriched setting of Orff-Schulwerk instruments and MIDI keyboards. Thorough instruction for each manual. Various styles of learning assessments.